Lockheed has had a busy month attempting to stake its claim to America’ staple military aerospace capabilities, unveiling their U-2 replacement concept. Now their large blended wing cargo hauling jet design, dubbed the Hybrid Wing Body, that has been in the works for over six years and aimed to be a great improvement in efficiency over existing U.S. Air Force transports, is moving forward in development. 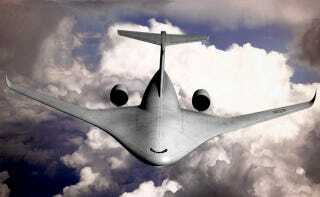 The idea behind the concept is to take the pure blended wing concept and add a large T-tail, a rear ramp and massive fuel efficient turbofan engines mounted over aircraft’s upper trailing edge. Lockheed says this design will be able to take off in less than 6,500 feet and fly 3,685 miles while carrying a 220,000 pounds payload. This payload can include any of the outsized cargo now hauled by the C-5 Galaxy (also a Lockheed product), and it can supposedly do all this while burning an astonishing 70 percent less fuel than what C-17 would. By keeping with a a conventional tail and rear ramp design, and keeping the jet within proportions of existing heavy cargo aircraft, an operational Hybrid Wing Body aircraft can still use existing infrastructure and many of the established operating concepts that have been in use for decades. This includes loading, unloading and making air drops via the aircraft’s rear ramp. During wind tunnel testing the over-wing nacelles reduced drag by 5 percent compared to the normal engine nacelles that hang under most jets wings. Keeping the rear tail, similar to a conventional aircraft’s empennage instead of a pure blended wing body’s neat tailless configuration, only increased drag by less than five percent. The aircraft actually uses a traditional circular pressure hull configuration, but adds additional unpressurized cargo holds in the inboard transitions between the fuselage and the wing. All these features combine to make a fairly exotic aircraft seem fairly conventional when it comes to actually putting it to use. Beyond a cargo variant that could replace C-5 and C-17 aircraft in the coming decades, Lockheed and its Skunk Works leading-edge design team have also come up with a tanker configuration that features two aerial refueling booms attached via pods to the the jet’s outer wings. Not only would such an aircraft be able to carry a lot of gas, but Lockheed says wind tunnel testing shows that it would be at least 15 percent more efficient than the troubled 767 tanker variant known as the KC-46 that the USAF currently has on order with Boeing. Broken Booms: Why Is It So Hard To Develop & Procure A New USAF Tanker? Since validating its design in the wind tunnel, Lockheed appears to have decided to really get behind this concept and plans to fly a four percent scale model version of it by the first quarter of 2016. It has also gained funding from the Air Force Research Lab to study a manned demonstrator to fly around the turn of the decade. This aircraft would be more of technology demonstrator, maybe based on a modified Gulfstream jet or airliner with a new wing a fuselage fairing, not an actual prototype of an operational aircraft design. Still, that is farther than we have seen Boeing or any other aircraft manufacturer go when it comes to flying an exotic new transport configuration. If testing proceeds and there is a demand (or money for that matter) for a new heavy cargo transport aircraft, an actual HWB aircraft could be in service by 2035. The cool thing about the design is that is is fairly scalable, with options ranging from a C-5 sized aircraft to a 757 sized aircraft. With this in mind, NASA is also studying the HWB aircraft for commercial freight applications. As such, Lockheed could have a new civilian freighter design on its hands too if a market materializes for it. We see a lot of wild aircraft concepts emanating from everywhere including prime aircraft manufacturers to kickstarter startups. As such, with any concept, no matter how glitzy the art may be, you have to take them with a grain of salt. Some graphics and some wind tunnel time is a far cry from fielding an actual full-scale flying article. Still, Lockheed looks to have already invested considerable money into this concept and has thought it through fairly well. Now that it is going into physical development, even if on a miniature scale in exciting. There is no doubt that there will be a demand for large cargo aircraft in the coming decades as the C-17 fleet ages and the C-5 fleet, even with its C-5M upgrade and consolidation, will eventually need replacement. This may be 20 years down the road, but if Lockheed continues with its HWB concept development, they will be well positioned to capitalize on this demand. Who knows, it could even emanate from the commercial aircraft sector before the military one, and with the Air Force Research Laboratory and NASA sharing part of the initial research and development cost, Lockheed may very well be taking the slow road to big aircraft success.